Welcome to Keystone! We will be holding live online sessions for new students and parents. 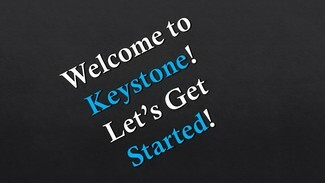 The purpose of this meeting is to go over some Keystone information, but more importantly to answer any questions that you might have about how Keystone works. Some of you may already feel very comfortable with your courses, but for those of you that have questions – now is your time to ask! All of Keystone's webinars are held using the online conferencing program called Blackboard Ultra. Click on the link below at the time of the meeting. You will be asked to enter your name and then you will be taken directly to the meeting. Try to arrive 15 minutes early so you will have time to get set up. For this meeting, your computer will need to have speakers. Because we have students all over the world, click here to find the local time for your webinar. Keystone uses a tool called “Blackboard Collaborate” to power our webinars. Use of this tool requires certain computer plug-ins, speakers or a headset, and a microphone if you want to ask questions verbally. (If you do not have a microphone, you can still participate by typing your questions). Here is a step by step instructional view on logging into Blackboard Collaborate. It can sometimes take up to 15 minutes for your computer to join the session, if this is your first Keystone webinar, or if you haven’t joined in a while, test your ability to join sessions by trying out the v12.5 Configuration Room the day before the webinar, or as early as possible before the webinar. This will allow you to get technical support if you need it in plenty of time to join the webinar. In addition if you are using a Mac and you experience any technical difficulties please refer to Blackboard Collaborate's Mac steps. Once you are able to log in to the Configuration Room as described above, you will be ready to join the webinar! Approximately 15 minutes before the starting time for the webinar, click on the link above. You may not see anything happening on your screen for a few minutes, but watch for boxes that pop up that require you to click to load the session. You may be prompted to update your Java, but this can take some time, and probably isn’t necessary to do unless the program will not load at all. You may also be prompted to download the BlackBoard Launcher. Once you Download the launcher Once you downlod the launcher you will enter the name you want to apear in the class then click log in. then you will be promted to click run. Once you click run it should put you in the class. Once the Collaborate interface loads, you should see instructions on the screen to test your speakers and microphone. Do this while you are waiting for the session to start. If you have trouble getting the session to load, first just try waiting a few more minutes. If it still isn’t loading, close your browser window and try clicking the link again. It sometimes helps to clear your cache before you re-try to load the session. If you have had trouble accessing the session, you may need to update your Java. It may also help to try a different browser such as Chrome or Firefox. If you have tried the above steps and are still having problems accessing the session, you can contact Blackboard Collaborate's technical support at 866-388-8674 Option 2. If you are unable to log in, we can send you a link to the recorded sessions, and some webinars are repeated during the month. Send an e-mail to [email protected] to request the link to the recorded session. If you miss a webinar because of technical issues, make sure to click on the Configuration Room before the next webinar, or call Blackboard Collaborate's technical support at 866-388-8674 Option 2.